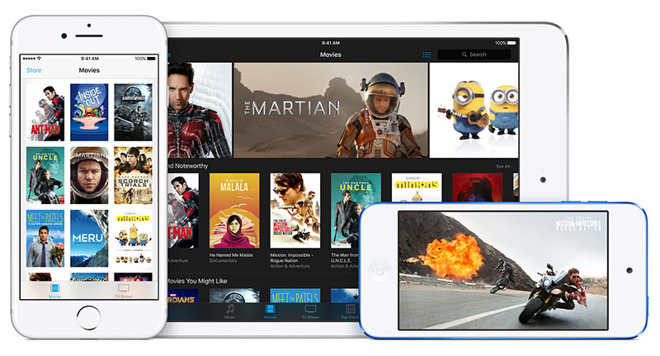 Facing increased competition from the likes of Amazon and Comcast, Apple's once commanding market share lead in the online video sales and rental industry has been more than halved, according to a new report. Citing Hollywood studio sources, The Wall Street Journal on Sunday said Apple's share for selling and renting movies, as well as other video content, has dropped to between 20 percent and 35 percent, down from over 50 percent as recently as 2012. The steep decline comes as competitors Amazon and Comcast enjoy market share gains on the back of aggressive industry moves. Amazon, for example, saw its share of the overall video business grow to around 20 percent, studio executives claim. The online retail giant markets its digital wares through the Amazon Prime subscription service, as well as individual sales and rentals marketed through Amazon Video. Comcast, the nation's largest cable provider, boosted its stake in the market to 15 percent after it starting selling digital movies and television shows to customers in 2013, the report said. Like other cable companies, Comcast has for decades rented video content to customers. Interestingly, the loss of market share is not uniform across genres, the report said. For example, iTunes is a top distributor of independent movies, as Apple promotes and signs exclusive deals for films made outside of the traditional movie studio system, sources said. When reached for comment, an unnamed Apple spokeswoman did not dispute the figures provided to WSJ, but noted iTunes movie sales and rentals increased over the past year and are now at their highest point in more than a decade. She went on to say that Apple is also focusing on delivering content to customers via subscription services like Netflix and HBO. While the report's numbers seemingly conflict with Apple's claims of growth, WSJ explains the combined market is on the rise. According to estimates from PricewaterhouseCoopers, U.S. digital movie rentals and sales rose 12 percent to $5.3 billion in 2016. Whether that accounts for iTunes' annual growth, but supposedly steep decline in market share, is unclear. The report also cites estimates from Bernstein Research, which claims iTunes video, music, book and magazine sales generated $4.1 billion in revenue. Also impacting iTunes' performance are streaming companies. The rise of subscription-based services like Amazon Prime and Netflix contributed to a decline in video-on-demand rental revenue, which according to PricewaterhouseCoopers dropped 4 percent to $1.8 billion last year. Movie sales also suffered a slowdown, with purchase revenues growing 21 percent to hit $3.5 billion last year as compared to a 29 percent year-over-year bump the year prior. The news comes as Apple looks to grow its booming services business, which includes iTunes, iCloud, Apple Music, Apple Pay, Apple Care and the various App Stores. The sector generated $7.04 billion during Apple's second fiscal quarter of 2017, up from $5.99 billion in the same period last year. CEO Tim Cook has said on multiple occasions that services is on track to generate revenues equivalent to a Fortune 100 company by the end of 2017.